The Gummy Maggots looked very lifelike (larvaelike? ), but had a distinct rubbery taste over the green apple flavor. (Better than natural maggot flavor, I guess.) Also, the package depicts a smiling cartoon worm exiting an apple – I’m sure a true depiction of maggots squirming around in rotting garbage or a days-old summertime animal carcass would be too off-putting. These seem to be geared toward goofy kids anyway, along with a few people in my office – they’ll eat anything that sounds gross, and usually enjoy it. Celebrating their silver anniversary in business, Archie McPhee is the retail segment of wholesalers Accoutrements, known more for their kooky and kitschy toys than candy, although we’ve reviewed plenty of their offbeat candy here before. 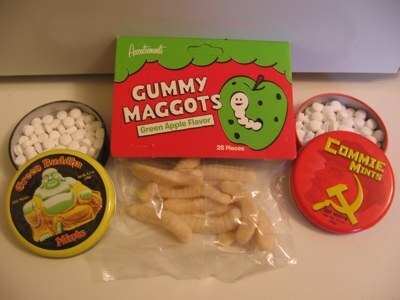 Still, I wish I’d gotten something more fun than mints and maggots. Perhaps a Cherry Flavored Marie Antoinette Head Lollipop, Gummy Human Heart, Black Lung Lemon Flavored Bubblegum Cigarettes, or Shakesperean Insult Gum would’ve been a bit more “krazy.” And they seem to be obsessed with bacon-flavored candy. Why’d I get no bacon? Despite the subpar candy – the emphasis here is on novelty, not candy – I can’t help lingering over their “Stupid Products” section: Man, I need some Inflatable Toast! What is not fun about maggots! I would trade for the Bacon Gumballs in a heartbeat, that’s for sure. Good trade. I’ll send my maggot leftovers to you immediately. I’m sure the commie mints lacked flavor because anything ostentatious would be against the proletariat. There’s some new(?) or at least unreviewed mints at Archie McPhee’s- Kali Mints(Curry- sounds somewhat icky to me), Fairy Mints (rose flavored)as well as Cotton Candy mints.